The AMC series The Walking Dead debuted on October 31st, 2010, and The Walking Dead trailer is what helped spark the show that has taken television shows to a whole new level . The first episode was a 90 minute show that would get things started in this new hit series. The Walking Dead trailer would captivate audiences and take the word “TV Series” to a new meaning as this show is the first zombie series to hit the waves. The zombie based show has both a story line and brutality that will capture all fans and viewers. The Walking Dead trailer opens up with the Sheriffs chasing down a criminal who is fleeing in a car with the cops in hot pursuit. 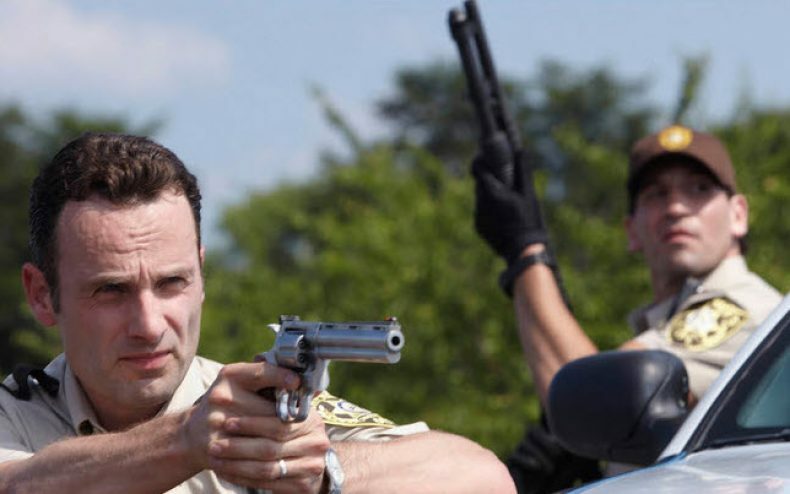 The main character, Rick Grimes, is stationed at roadblock up ahead with other police man ready to end the chase. The chase ends with the car flipping over from spike strips and then a shoot out occurs as the fugitives emerge from the vehicle. Rick, who is Shane’s partner, gets shot pretty bad by what appears is a shotgun and ends up in a coma in the hospital. When he awakes he is all alone and the world he knew is gone as the zombie apocalypse has take over. The Walking Dead trailer goes on to show a little bit on how the series takes off and small scenes of what is yet to come. It shows him looking for his family, the problems in Atlanta, and even some of the other characters. If you have yet to watch The Walking Dead then take the time to watch The Walking Dead Trailer and you will be hooked. The Walking Dead Trailer is about 4:35 long and it is time well spent.